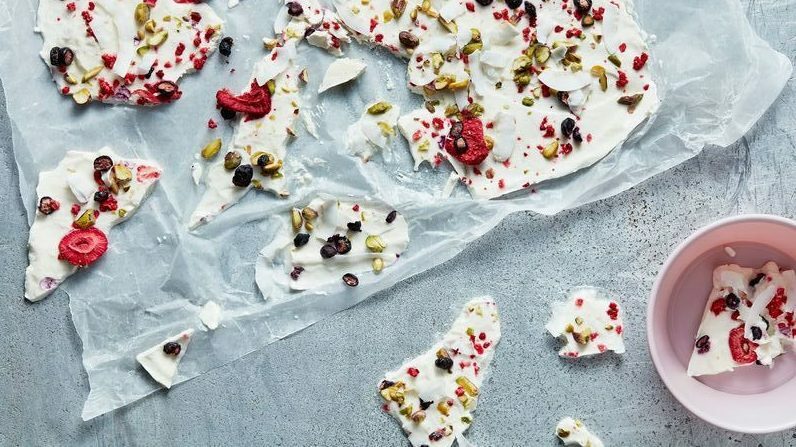 This Frozen Yoghurt Berry Bark is a great healthy recipe to get the kids involved and make them think that they are eating a naughty snack. You can top with any combination of nuts, fruits, chocolate and have some fun. LINE a baking tray or small freezer-safe pan with greaseproof paper. SPREAD the yogurt thinly, about 1cm thick, on the greaseproof paper. SPRINKLE the pistachios and strawberries evenly over the yogurt. REMOVE from the baking sheet once frozen. Break into small pieces and serve immediately as it defrosts quickly. STORE extra pieces in a freezer-safe container. WRAP baking paper around the pieces of bark when serving, to help little ones eat it (it can be cold to hold and melts quickly).